A child riding joyfully on a three wheel scooter, winding through the streets of the neighbourhood is a delightful sight to watch. The scooter comes with leisure and exercise all packed into one,encouraging the child to go out and explore the world. This three wheeled wonder can also turn into an excellent gifting option for parents to present their child with. So parents, before you finally buy one, you need to know about the best three wheel scooters that are available today, to ensure your child doesn’t miss out any of the fun. 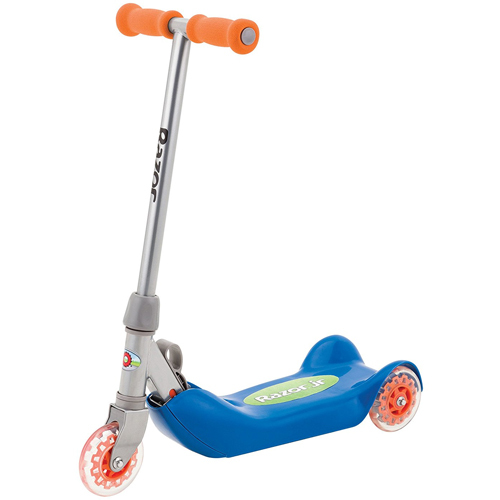 Three wheel scooters come in various designs with diverse features, aimed at children in different age groups, and children with differing levels of motor and balancing ability. Some are foldable, while some are not. Some are sturdier and heavier than others. We have compiled below a list of the ten best three wheel scooters of 2018, so that you can present a gift which your child will cherish for a long time. Recommended for kids of all ages, three wheel scooters are stable toys that keep children entertained. If you are looking for a reputable brand that you bundle of joy will enjoy using for long, consider this model. Recommended for kids aged 2-5 years, you get a versatile product made of high-quality materials. 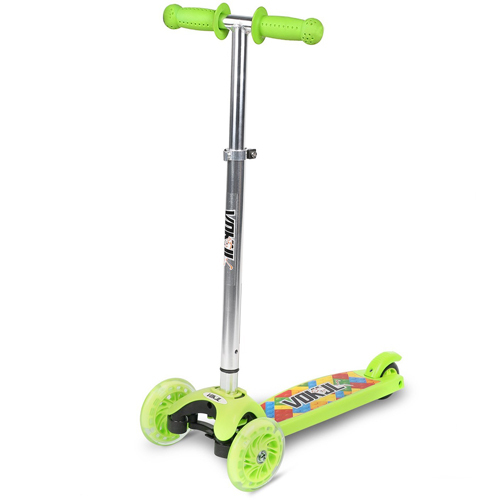 Its low-profile design is easy to mount and ride, while its fun-looking green-themed finish appeals to kids. What makes Micro Mini Kick Scooter an excellent option for toddlers? If you are planning to buy one, do not hesitate. Your kid will enjoy using an original one for many reasons. The three polyurethane wheels that it has, for instance, are among the best. They are durable, quiet, and have premium bearings that roll smoothly on all terrain. The low-profile fiberglass frame that you get is also one of a kind. Even though light, it supports a lot of weight. It also absorbs shock well and has a well-engineered design that your kid can maneuver effortlessly outdoors. When shopping for scooters for their kids, safety is a major concern for most parents. If you are one of them, you will never regret buying this brand. Its stable three-wheel design is fun to ride. You do not have to worry about your kid tumbling over at high speeds. It also has a sturdy aluminum handle (with non-slip grips) that boost both the stability and safety of kids further. This CPSC-certified kid’s toy weighs only 5.4 pounds. Instead of weighing down your kid with one of the heavy models available on the internet, buy this one. It is very easy to maneuver. The kid safe materials and finishing used in its production boost its value further. Micro Mini is a lightweight scooter with a low-profile fiberglass platform. It supports up to 44 pounds. Moreover, because of its stability and ease of use (lean to steer), most kids find it fun to use. Consider buying one for your baby boy or girl. It will keep him/her active and happy. Many people know and like Razor for the best skateboard helmets that it has manufactured over the years. 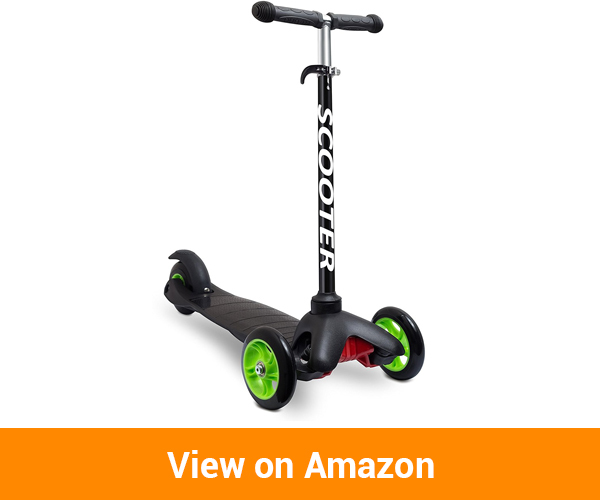 Fortunately, most of its scooters are also among the bestselling brands in the market. 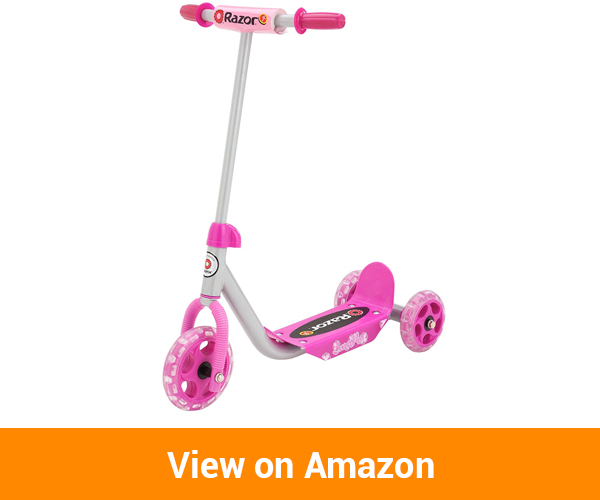 Buy Jr. Lil’ kick, for instance, to get a pink-themed three-wheel scooter for 3+-year-old kids. This is a charming product. Its stable three-wheel design also appeals to both kids and parents because of its stability. The risk of it toppling over, even at high speeds, is very slim. Whenever you are shopping for a scooter, look for a well-engineered product that your child will enjoy riding. This is one of them. Apart from its stable three-wheel design, the quality of its deck stands out. It supports up to 45 pounds without buckling or breaking. Its wide and stable design also has a slip-resistant finish that boosts the safety of kids further. 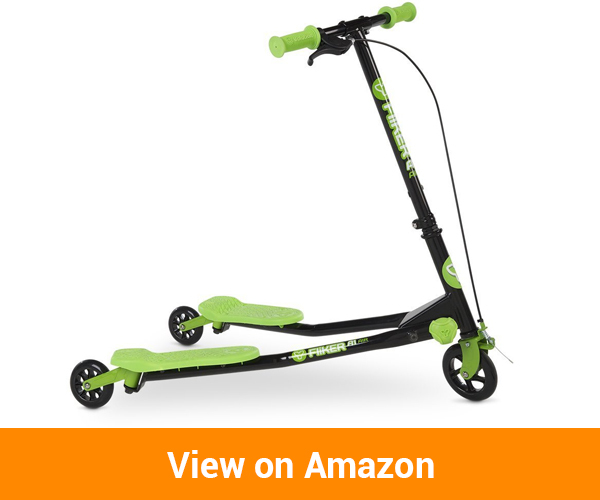 Because of its welded T-bar, this scooter is easy to maneuver. You do not have to exert a lot of effort for it to corner left or right, as is the case with some low-grade brands. The bar has padding for comfort and a large front wheel (fixed) that boost the performance of this scooter. On concrete, tarmac, or grass, your kid will enjoy riding it every day. Are you shopping for an affordable toy for your kid’s upcoming birthday? 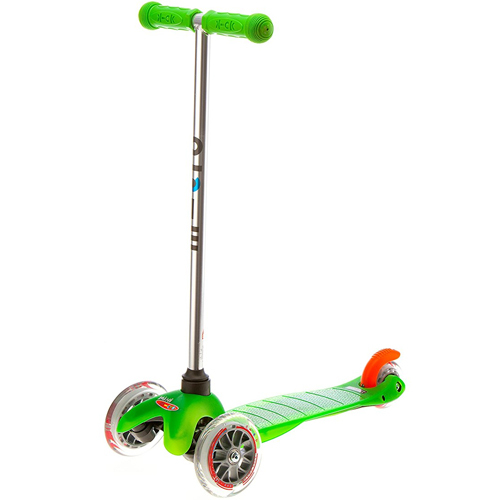 This Razor Jr. Lil’ Kick Scooter is an excellent choice. Even though durable and functional, it retails cheaply in reputable web and offline stores. Because of its double rear wheels, this scooter requires a bit of skill to use safely. Fortunately, this is never an issue for most kids. Its three-wheel design is not only stable, but also fun to ride. It also has a durable metal frame with a wide and non-slip platform that supports up to 45 pounds. Toys such as the best activity cubes keep kids engaged at home. However, to keep your kid active and happy as well, buying a three-wheel activity scooter is a good decision. 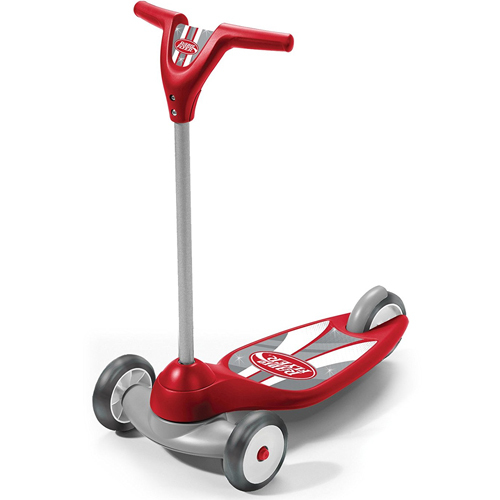 This red-themed My 1st Scooter from Radio Flyer, for instance, is a popular brand with many admirable features. If your child is a beginner, for example, he or she will enjoy using this product for many reasons. Its extra wide base is stable. The risk of slipping and falling off it is slim. Its well-placed foot brake, on the other hand, delivers instant stopping power to boost safety. With some brands of scooters, steering is an issue for kids. The slippery wheels, for instance, lower tractions. Other brands have poorly balanced or cumbersome designs that require a lot of effort to move. This model is different. Even though designed to support up to 50 pounds, its lightweight design (4 pounds) is admirable. The two wheels on its front, on the other hand, not only improve its stability, but also steering. Does the scooter in your kid’s possession injure his or her ankle whilst in use? This is common with scooters with two wheels on the back. Radio Flyer My 1st is different. The single low profile wheel at its back is non-irritant. Furthermore, because of its tapered base, kids have a clear kick path for propelling it forward. Your boy or girl will enjoy using one. The high-quality polyurethane wheels fitted on this scooter boost its performance. They roll smoothly on all terrain. This lowers the amount of energy that kids should exert to propel it forward. It also has a stable handle with non-slip plastic grips that do not irritate kids over time. If you have speedster at home, this is not a good scooter for him or her. However, if you are looking for a stable and kid-safe product that works well, buy one. It supports up 50 pounds. Kicking and steering are also easy because of its wide base (tapered) and quality wheels. Kick scooters, like skateboards, are fun-to-use outdoors accessories that also keep kids active. If you are looking for one for your 5-12-year-old kid, you have come to the right place. Spend a few dollars on Micro Maxi to get a durable Swiss-designed kick scooter with a stable three-wheel design. Its metal frame last for long. It also has a solid structure with replaceable components that are readily available on the Internet. Whenever it breaks down, you can repair it easily and on budget. Did you know that the performance of scooters lies in their wheels? The low-grade ones that people buy online ride roughly at high speeds. Others are not only brittle, but also have poor shock absorption. This is not the case with Micro Maxi. The three PU wheels that it comes with are of high quality. They ride smoothly on all terrains. These include both suburban and urban pavements. They also have durable designs with impressive traction. Recommended for 5-12-year-old kids, this scooter’s ease of use is invaluable. 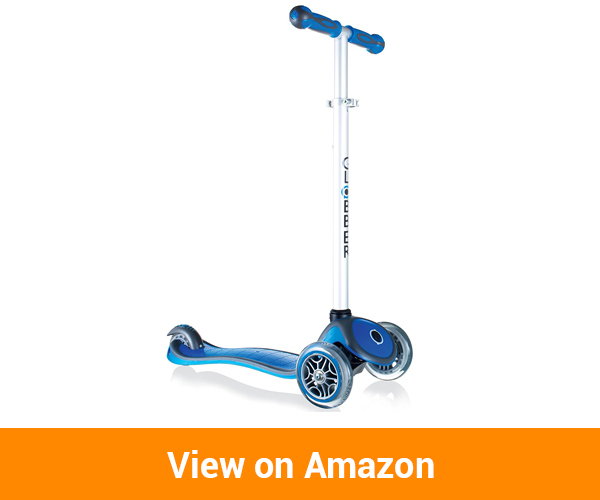 Whether you are a beginner or an experienced kid, he or she will have an enjoyable time on this scooter for two reasons. First, kicking is a breeze. You do not have to worry about a poorly placed rear wheel crushing your kid’s ankle. The lean-to-steer technology that it has is also one of a kind. With a gentle push, kids can steer it left and right. If you do not fear to spend money on kid’s toys, this is one of the best three wheel scooters to buy. It is a durable product. Its wheels and frame are long-lasting. Your 5-12-year-old kid will enjoy riding it. 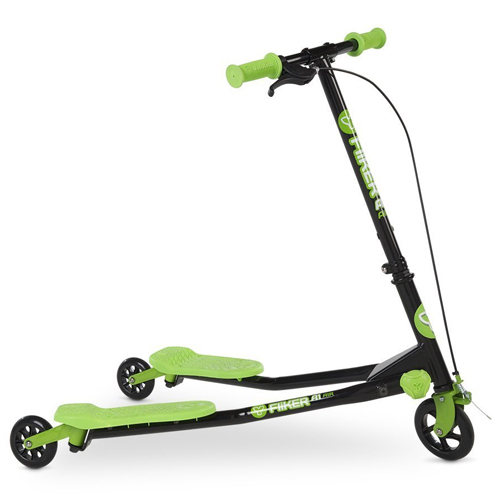 This folding kiddie scooter from Razor is a unique product that works better its competitors do. If your kid likes scooters nut has stability issues with her current products, replace it with this one. Its unique three-wheel design is not only stable, but also fun to ride. Furthermore, because of its low-profile design, new rides can mount and get off it easily, which is admirable. During his or her free time, you will have a hard time separating your kid from this toy. Retailing in blue and pink, this is an eye-catching scooter. If you are looking for a durable one that will serve your kid for long, it is also one of the best in this niche. The heavy-duty steel used to make its frame is not only light but also durable. Bending, rusting, and corrosion, for instance, are non-issues. You also get a sturdy plastic platform and a lightweight aluminum handle with a padded T-bar. Do you struggle to store the scooter in your child’s possession? If you are planning to replace it, choose this brand. It folds compactly for easy storage. During your outdoor trips, you can also travel with it effortlessly. 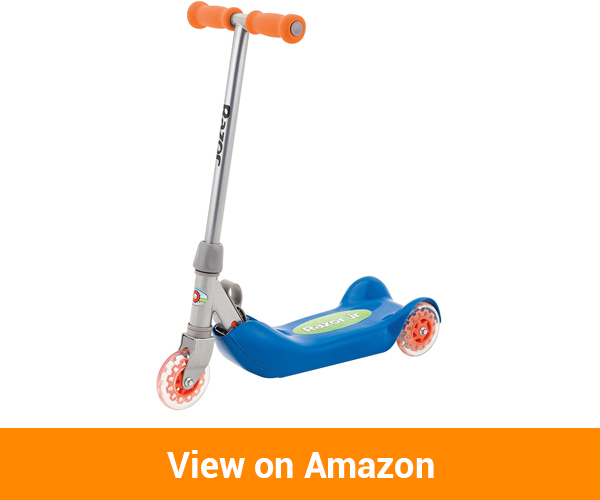 Designed to support up to 45 pounds, this is a suitable scooter for kids aged 3+ years old. In terms of safety, it is also one of the best brands in the market for many reasons. Its polypropylene deck, for instance, has a slip-resistant finish that is both safe and eye-catching. The urethane wheel it comes with grip most surfaces well. Finally, its handles have comfortable soft foam handles that do not irritate kids. This scooter’s fixed handlebar is a bummer. As your child grows, you cannot adjust it to accommodate his or her height. In terms of safety and stability, however, it is one of the best in 2018. Its rear wheels, for instance, have fenders that protect ankles from injuries. It also has a stable design with a non-slip deck made of quality polypropylene. 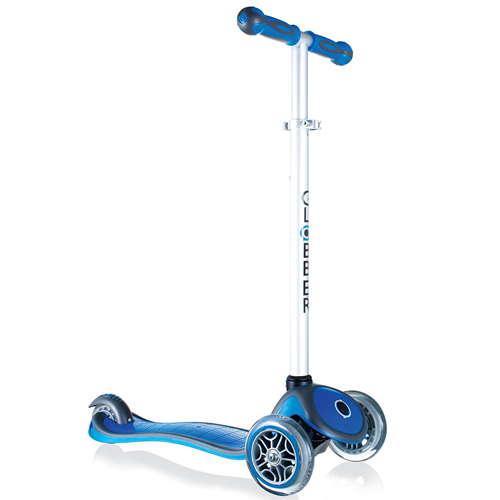 Featuring an eye-catching grey and blue theme, Globber Scooters is a recommended product for kids aged 2-6 years. Even though its unique style has attracted it many positive reviews, it stands out because of its superior design. 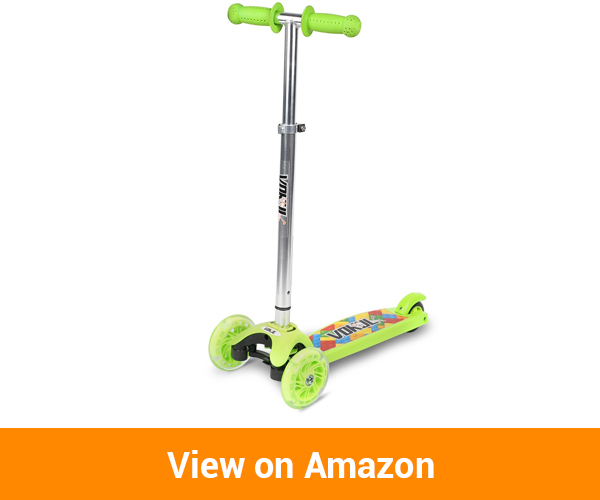 If you have a heavy child, for instance, this is one of the best scooters to buy. Its reinforced steel plate deck supports up to 110 pounds. This is more than double the load capacity of most leading brands. Because of its low deck clearance, it is also stable than most of its competitors are. 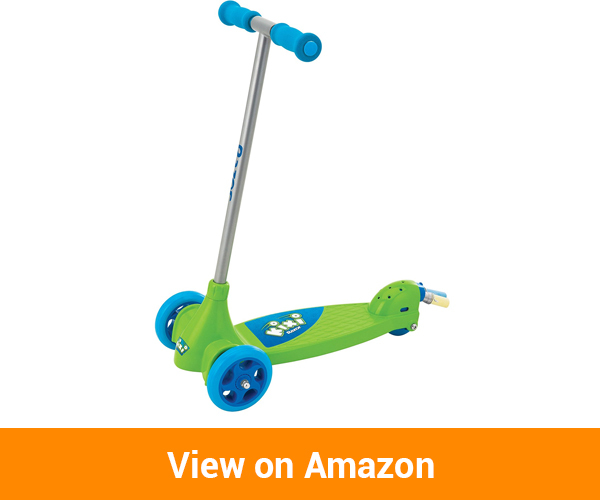 Many reputable scooters for kids have fixed handlebars. Even though cheap, their limited functionality always lets down kids and parents alike. Globber Scooters Globber Primo, however, is a versatile brand with an adjustable handlebar (16.5-31 inches). As your child grows, you do not have to buy many different scooters. All you have to do is adjust its handlebar accordingly to maximize comfort. This is a simple process. Does your child enjoy riding scooters on tarmac or your sidewalk? To get a model that performs well on both terrains, do not hesitate to buy Globber Scooters Globber Primo. Its sturdy frame withstands abuse well. It also has high-rebound PU wheels (with ABEC-5 bearings), which ride smoothly on all terrains. Because of their efficiency, scooters reach astronomical speeds. To keep your baby safe, therefore, look for a model with effective safety features. Globber Scooters Globber Primo is one of them. Its long rear brake covers its entire wheel. This guarantees an efficient braking in all terrain or weather. It also as a spring loaded steering mechanism that dampens shock and a secure lock button that keeps it straight. Fitted with a sturdy steel deck and an adjustable handlebar, this is a versatile three-wheel scooter. Its PU wheels ride smoothly on most terrains. Set up is a breeze, while its many safety features come in handy outdoors. 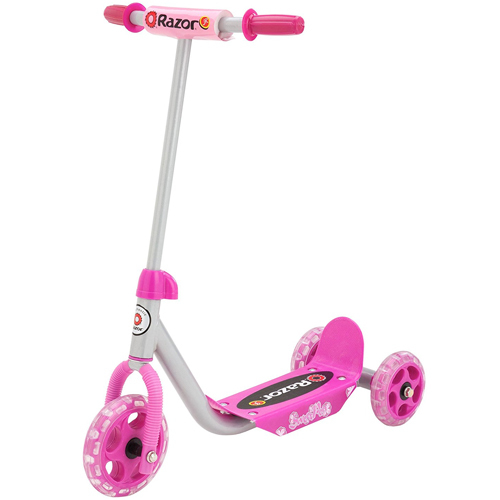 If your child enjoys spending time outdoors, you can never go wrong with a Razor scooter. Liked for their fun designs, most of its three-wheel versions are popular among kids. They are also durable and designed to keep kids active, which has its share of pros. The Kixi, for instance, is an extra-wide green-themed brand that is perfect for beginners. It has a stable design. It also has an extra wide and low profile deck made of quality plastic. Do not confuse this scooter’s simplicity for a weakness. Its feature-packed design is not only fun to use, but also has positive health effects on the body. Recommended for improving balance, for instance, it works better than exersaucers or baby walkers. By keeping kids active, it also lowers the risk of obesity. Like most products that we have reviewed, steering this three-wheel scooter is a piece of cake. Unlike two-wheel model that require kids to balance and kick at the same time, it takes care of balance. The patented tilt to turn feature that it has is also invaluable. Tots, albeit small, can turn both ways effortlessly. Razor Jr. Kixi has numerous add-ons that kids like. The chalk bar on its rear wheel, for instance, is fun to use. It is non-toxic. You can set it up and remove it on demand without issues. The foam grips on its handlebars are also ideal. They protect the palms of kids from bruises. 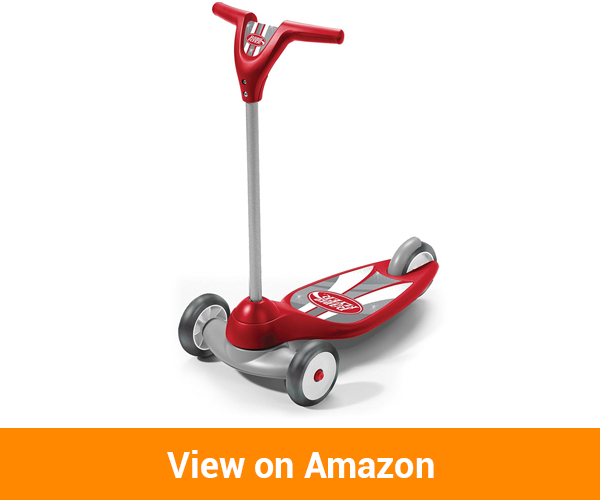 Perfect for kids, this wide and light scooter improves how children play outdoors. Riding it is not only easy but also fun. Parts are durable and baby-safe. Finally, the kid-safe add-on it comes with keep children engaged outdoors. Kid’s bicycles, even though fun to use, are bulky and cumbersome. They are also expensive and, therefore, beyond the reach of some parents. If you are one of them, buy this Vokul Mini Kick Scooter instead. Its stable three-wheel design serves most 2-5-year-olds well. It also has a durable design with a low profile deck that rarely frustrates kids. To stay comfortable, the scooter that you buy your kid should be of the correct height. Unfortunately, finding an ideal brand is often a chore, especially for novice parents. Choose Vokul Mini. The adjustable T-bar that it has is not only stable, but also comfortable to use. As your child grows, you can adjust it effortlessly to orient his or body naturally. This lowers the risk of back injuries. It also enables to play for long without getting tired. Under stress, the quality wheels of this scooter do not fall off, as some cheap brands often do. Made from shock absorbing and anti-abrasive polyurethane (PU), their durability is amazing. All wheels also have durable ABEC-5 bearings that work quietly at low and high speeds. Your kid will like this product as a birthday gift for many reasons. Its stability and ease of use, for instance, are admirable. After a few tries, he or she will enjoy riding it outdoors on all terrains. Its wheels and platform are durable, while its adjustable handlebar maximizes the comfort of riders. With Den Haven, you kid will zip around your neighborhood without scarifying both comfort and safety. This scooter also has a stylish design with many premium features that boost its performance outdoors. Made of metal, for instance, its T-style handlebar is not only stable but also durable. The risk of it snapping whilst in use is slim. The nylon composites on its handlebars are also ideal. Their soft and non-slip designs improve the safety and comfort level of kids. During their first few days on standard scooters, kids tumble because of stability issues. To ease the process for your kid and enhance his or her safety as well, buy this three-wheel model. Its stability is laudable. The risk of it tumbling at high speeds is slim. 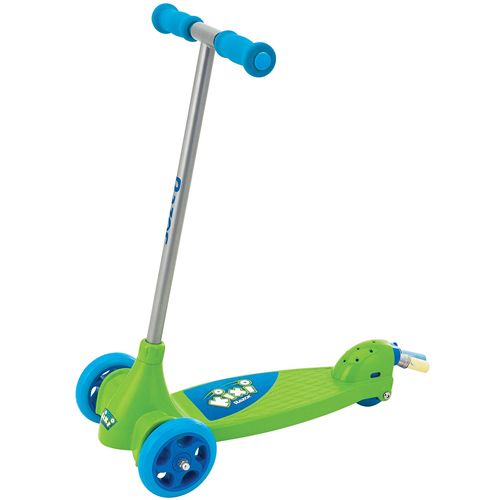 It also has a wide and non-slip deck that fits most kids and quality PU wheels that grip surfaces well. If you buy an original model online, you do not have to worry about this scooter breaking down over time. Made of aluminum, its frame is light yet durable. Breakages are not common. It also resists rust and corrosion over the years and has a kid-safe design that looks good. Because of its lightweight design and quality of construction, this is a fast three-wheel scooter. As he or she polishes his or her riding skills, your kid will reach astronomical speeds, which is fun. It is also one of the safest models in the market. Wheels are stable. Its large and reinforced brake pedal (aluminum), on the other hand, delivers instant stopping power. This is a high-quality product. Even though some people complain about it plastic socket, it supports up to 77 pounds well. It also has a durable frame (aluminum) with an adjustable handle that fits most kids. 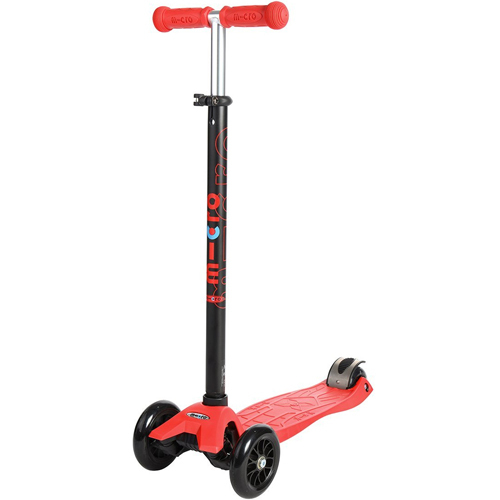 Perfect for performing drifting and carving actions, Yvolution Y Fliker Air A1 is a versatile push swing scooter that offers value. Its unique three-wheel design is eye-catching. Even though it looks intimidating, it is also one of the easiest to use on our list. Most 5+ year old can mount it and ride it on most terrains. Because it supports up to 110 pounds, the risk of its crumbling under the weight of its riders is also very slim. 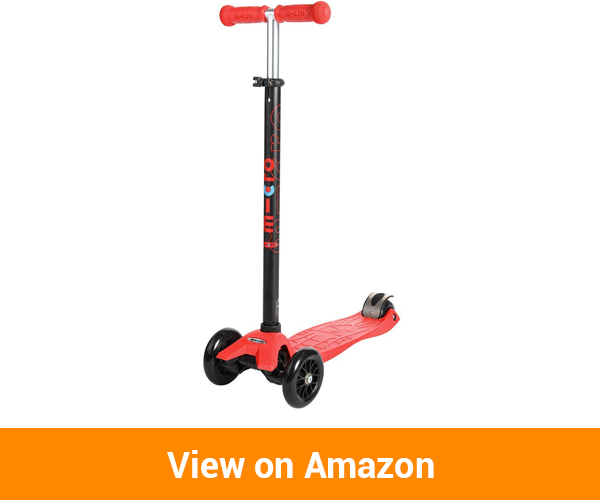 Unlike some brands of scooters that we have reviewed, you do not have to kick this one to move forward. Once you are stable on its platform, all you have to do is swing your hips and legs from side to side to propel it. This is an enjoyable process. It also keeps its riders active. Do not let this scooters unique design to intimidate you. If you are looking for a safe day-to-day brand for your bundle of joy, this is one of the best in 2018. Its three-wheel (PU) is stable. Each model that you order online also comes with a quick-response handbrake that works well. During emergencies, you can stop it on a dime without exerting a lot of energy. This is an eye-catching three-wheel scooter. The fact that it can support up to 110 pounds is also desirable. Set up well most 5+-year-old kids can ride it for hours without issues. Finally, its eye-catching design and responsive braking system have attracted it praise from parents. Load Limit: Three-wheel scooters are costly accessories. Buying a model that will snap under the weight of your child is one of the worst decisions you can make. To avoid such heartaches, check the load limit of your product of choice before buying. Can it support the weight of your kid? 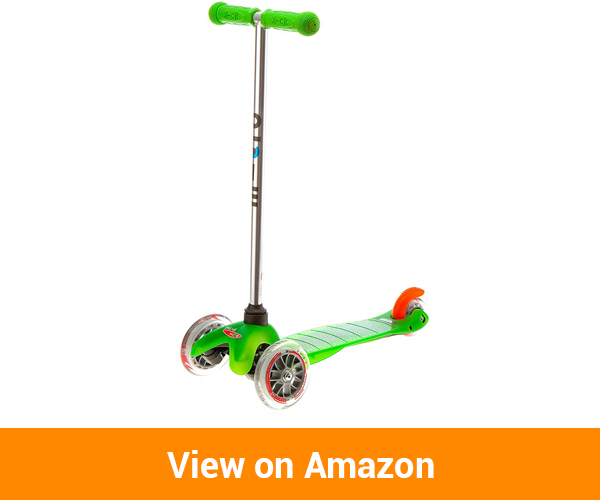 If your child weighs 50 pounds, do not buy a scooter that supports only 30 pounds. Stability: Tumbling over on scooters is part of the learning process. However, buying a product will compromise the wellbeing of your boy or girl is not worth it. Check the stability of your scooter of choice. Make sure that your child will enjoy using it before reaching for your wallet. Safety: Is the product you are planning to buy safety certified or not? Check its braking system. Does it have one? If yes, is its system effective? Buying a scooter that is hard to stop at full speed is a poor decision. It should also have a non-slip platform and non-irritant handlebars. Considered: Among the best three-wheel scooters in 2018, the items we have reviewed serve kids well outdoors. Their sturdy and stable designs are fun to ride. They are also durable and have responsive safety features that keep riders safe. If you are an avid gamer , we highly recommend checking out gaming steering wheels we reviewed recently. Simeon is a passionate entrepreneur who holds a Bachelor’s of Technology Degree in Food Engineering and pursued entrepreneurship after completion of his Degree. His most favourite project is BestViva – an online review site that gives authentic unbiased product reviews. Through his expertise and stuffs he has learned through the years , he aims to providing highly engaging and trustworthy product reviews to his audience.